I recently attended The Stella Prize lunch at the Sydney Writers’ Festival which was hosted by The Hoopla e-zine. The event was sold out. Apart from one brave male, I found myself in a room packed with an assortment of published women writers, book clubs and writers’ groups who had gathered to be entertained by Wendy Harmer, and listen to five fabulous Australian women authors, namely, Tara Moss, Di Morrissey, Anne Summers, Anita Heiss and Anna Krien. The purpose of the lunch was to support the inaugural Stella Prize which has been set up to counter gender bias against women writers and rival other literary awards such as The Miles Franklin. The Miles Franklin Award is named after Stella Miles Franklin who was compelled to write under a male pseudonym in order to be published at the turn of the 20th century. Sadly, despite being founded by a female, few women have been awarded this leading accolade. The Stella Prize (also named after the same author) will hopefully raise awareness of this imbalance. I understand that her goal came from Elizabeth’s realisation (following upon a blogpost by Tara Moss) that a majority of women are nominating books written by men as their top reads. In other words, women are as guilty as the next person in failing to recognise the contribution Australian women authors are making to the literary landscape. So what is involved in the challenge? It’s simple. Read and review Australian women writers throughout the National Year of Reading in 2012 then set up a link on Elizabeth’s blog. At last count there were 362 readers who’ve registered for the challenge. And 896 reviews posted! Elizabeth has also given the opportunity for women authors to bolster their profiles by inviting them to post a review of a book outside their own genre. I was very excited to be able to do so by reviewing Josephine Pennicott’s Poet’s Cottage. Many thanks, Elizabeth, for inviting me to contribute. As for the Stella Prize lunch, a trivia quiz with 18 questions was conducted as a way of adding interest to the proceedings. (It was diabolically difficult – or at least I thought it was!) The winner, who had correctly answered 16 of the questions, was duly given her prize. I don’t think she was asked her name. It was only later that I discovered it was Elizabeth Lhuede. The irony of this was not lost on me. Here was a modest woman, a writer, who was making an enormous effort to assist The Hoopla’s own fantastic goal of advancing Australian women’s writing and the Stella Prize. And yet she went unrecognised. So I’m doing it now in a small way. Well done, Elizabeth. Thanks for all your hard work! 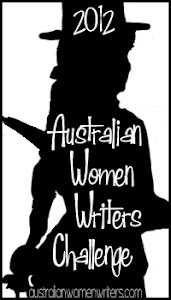 You can follow AusWomenWriters on Twitter and Facebook. Enormous credit should also go to Shelleyrae at Book’d Out litblog who is a prodigious blogger and tireless reviewer for the challenge. Follow her on Twitter and Facebook or join her Goodreads discussion group on AWW2012. And don’t forget to join the AWW2012 Challenge! Elizabeth absolutely deserves the accolades and I am incredibly grateful to her for starting the AWW Challenge allowing me to discover the fabulous local talent in Australia. Thanks for dropping by. You’ve done such a wonderful job as well, Shelleyrae – and I’m trying to comment/like on reviews on Wednesdays as suggested! Good to see you here, Anna. I’m also discovering how many Australian women writers there are. No wonder it’s consuming all your reading time!